While Werner Herzog is a mere mortal, I think of him as a force of nature, an unlikely phenomenon, like those little balls of blue lightning that sometimes roll through swamp on a fog-thickened night. This filmmaker who, in telling the tale of a madman who carried his cargo from one Amazonian river to another by pushing a steamship over a mountain, decided to film the event by literally pushing a steamship over a mountain, has become a kind of mythic Flying Dutchman himself. When years ago actor Joaquin Phoenix flipped his car on a Laurel Canyon road, he heard a knocking on his window and a German voice telling him to relax. "That's Werner Herzog!" thought Phoenix. He got out of his car, said "thank you," and Herzog was gone. This quality of Herzog's - being simultaneously both richly human and magically mythic - was certainly at work in this larger-than-life auteur's brief encounter with Periphery Man. ...I was working for a publicist -- which means it must have been a time of extreme poverty, some period where my time was truly worthless; why else would I have been willing to sit in the closet-sized back room of an office for an entire day folding a press-release page into hundreds of envelopes? The only thing I remember about the job itself, which was mercifully brief (think I lasted two weeks), was that after spending a day doing one particular mass mailing, I had to do it all over again, because there'd been some crucial mistake made in the copy. Not my mistake, thank God, but still, an unnecessary refresher course in existentialism. That the publicist's apology for the mix-up was cursory, even snarkily amused made it like being in a Grimm's: the troll's all-night task you're forced to do, found undone in the morning. The next day when I was sitting behind my desk, licking envelopes -- that's how long ago this was, pre-dating self-adhesive stamps (and yes, I had one of those little sponge thingers in a dish of water to wet the glue of the envelopes, but I'd occasionally lapse into old-fashioned licking, thinking to myself, it's come to this, I am a Licker, a human tool hired to moisten the flaps of loftier, more important humans' announcements of Significant Activity) -- the publicist brought in a client. The publicist was an officious man, always busy-busy-busy, with an air of self-importance (he had, after all, his own Licker), clearly much taken with the celebrities he was hired to publicize and the rarified air he was able to share with them. On this occasion, though the office was so small that one could hear any activity or conversation clearly from one or the other of the two rooms, and the most natural thing would have been to at least introduce me to his guest... the publicist stayed with him in the other room. I kept on with my envelopes, not really paying much attention to what was being talked about mere yards away on the other side of the wall, and then, subliminally aware of a lull in the dialogue, looked up to see a face peering at me round the door jamb. This was Werner Herzog. He was in town to promote a movie. The celebrated obsessive, whose films were like epic, exquisitely rendered fugue states, windows into history presented as a lucid but lunatic dream, leaned shyly into my cubicle. And even as the publicist appeared to dutifully introduce us, he was smiling. "Yes, we have already met," he said. Smiling back, puzzled, I shook my head. This I would have remembered. "I don't think so," I ventured. "We have," he asserted, still smiling. His hair had an Albert Einstein-like unruliness, a bushy mustache and rumpled sweater furthering that great-but-scattered-mind association, but his eyes were clear, penetrating. He spoke with happy, thickly accented confidence, if anything appearing even more pleased by what seemed to me to be an awkward misunderstanding. "You have been to Berlin?" "No, never," I told him. "And this is my first visit to your city," he said, eyes alight, as if he'd found the key to unlock an intriguing equation. "But this is how it is with us, sometimes. I know your face, and we have known each other, even if it is perhaps in another life." I didn't have a quick comeback for that one. He gave a philosophical shrug, continuing to beam at me as if we were, in fact, old friends. And the publicist, who had been standing by with thinly veiled impatience as he looked from his client to his minion (bristling, I intuited, with the indignity of having lost the great man's attention) dropped some harmless platitude into the conversational gap, and led Werner from the room. Our paths haven't crossed since. Though -- who can tell who's dreaming us? -- for all I know, we continue to be very close. That is so fantastically random - i love it! i wish i could get away with saying stuff like that. But i have a feeling people would just give me "PAAAARDON?" At least you didn't piss him off! The only famous person I ever had significant contact with was Harlen Ellison and I needed a round of anti-venom treatments after that one. You actually EXPERIENCED the teen's celebrity fantasy; that they'll SEE us and want to be best friends, thus validating our lives. So freaking great!!!!! Love the juxtaposition of earthy spiritual Werner vs. slimy stingy spin doctor. Do you think he recognized a fellow artist amidst all the crapola of promotion? Or something like that. JJ, from all reports Mr. Ellison is one prickly porcupine of a m-thaf-cka. Lis, never thought of it that way but now that you mention it, I'm doubly happy in retrospect. Great story. Got to love Herzog and the effect he seems to have on his surroundings. I guess it must have got wide coverage at the time, but have you seen this clip where he gets shot during a BBC interview? 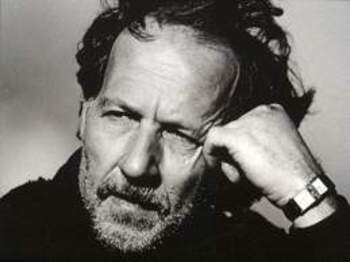 Excuse me for my back woods ignornace in advance, but WHO is Werner Herzog? 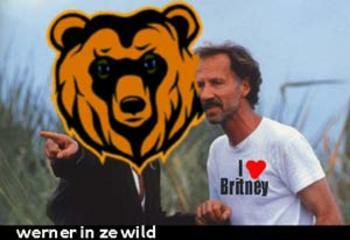 I just looked him up on IMBD, and found that "Grizzly Man" movie, and a lot of titles in German... So I take it he's a famous GERMAN director, right? With not a lot of U.S. success? Still, interesting story. Sounds like Werner Herzog had a creative memory if nothing else. Find any practacle uses for that "licking" skill you acquired so many years ago? Greig, thanks so much for the clip! I hadn't seen it, and it's quite wonderful. 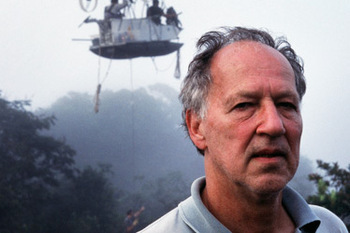 E.C., a great place to start with Herzog is his film "Aguirre: The Wrath of God" -- you should be able to rent it on DVD. Lots of good details on his life and work in the very first link of my post (Wikipedia) and you might enjoy the cool clip Greig provides, above. Maybe with a little regression hypnotherapy you will be able to relive your original Werner Close Encounter of the Best Kind. I wish I had a clue what Mark just said. "Zelig" refers to the Woody Allen movie about Leonard Zelig, the Chameleon Man, who became just like whoever he was with... In Mark's preceding comment, the "errol m stories" must refer to filmmaker Errol Morris, who Herzog famously lost a bet to, thus requiring Herzog as a consequence to literally eat his shoes (filmed by Morris as a documentary short and released, I believe, as "Werner Herzog Eats His Shoes"); Mark produced one of Morris's earlier films, "The Thin Blue Line." Sounds like Werner Herzog had a creative memory if nothing else. Find any practacle uses for that "licking" skill you acquired so many years ago? You sound like a human, not a spam program, so thanks for the comment, but - what's with your handle? I routinely delete any comment that links to a commercial site (and will continue to do so, despite this one-time instance), so if you'd like to have conversations on this blog, please sign in with an alternate (i.e. not product-linked) visitor name. 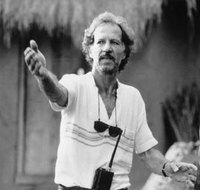 Back in the 1980s, I wrote my university Master's thesis on Werner Herzog. 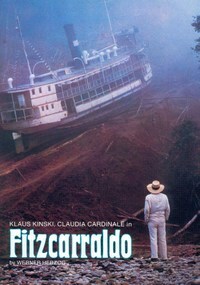 I love his films, especially the ones before "Fitzcarraldo." A year or so after I had finished it, Herzog came here to L.A. to give a reading of a book he wrote ("Vom Gehen im Eis") at a German cultural center. I brought my thesis along with me. When Herzog had finished his reading, he offered to sign books, and I asked him to sign the cover page of my thesis. He looked at the title — "Politics and the Primal Eye: Four Films by Werner Herzog" — and then said, "Can I give it an A without reading it?" I, too, prefer the earlier ones (AGUIRRE, HEART OF GLASS...).